MARTHA MOMENTS: Which Cover for October? I like the apple cover. I was thinking just the other day "if" the cover would have pumpkins somewhere. I love the colors of the Apple arrangements. It pops out a bit more than the other. 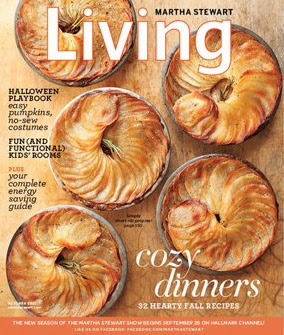 Well the cozy dinner cover arrived at my house last week and I have seen it on the newsstands too, so I think they decided on that one. Maybe it's on the iPad edition. Cat's out of the bag... cozy dinner cover it is for subscribers, newsstand and iPad edition. I really wanted the apple cover to win. It is more vibrant. I might try and recreate the cover scene at home. It does look wonderful. 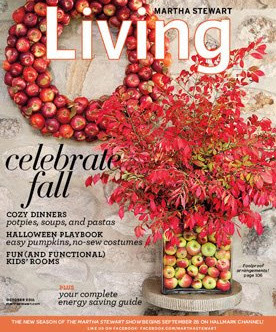 I definitely am a bigger fan of the "Celebrate Fall" cover because it "Pops" visually. The other cover, is too quiet and monochromatic. To me, Fall means vibrant color! October is in my view open season for apple pie here in the UK. Cozy Dinners is my preference they look good enough to eat just missing devonshire cream!